The realization that your parents need help in their senior years usually starts with noticing small things. Maybe your mom doesn’t keep the house as tidy as she used to or your dad doesn’t shower as often as he should. Caregiving may begin with stopping by to check on them a few times a week, but as your parents age it can quickly become an all-consuming responsibility. Are You Experiencing Caregiver Stress? Many caregivers don’t recognize the signs of stress until it has already begun to impact their health. Adult children caring for a parent tend to focus so intently on the needs of their mom or dad that they neglect to care for themselves. It’s not unusual to experience stress-related problems like headaches, overwhelming fatigue or a compromised immune system. Ignoring these warning signs can result in even more serious health concerns, including depression and increased risk of heart disease. If you recognize yourself in the symptoms listed above, take comfort in the fact that you don’t have to bear the burden of care alone. In fact, one of the best ways you can ensure that your parents receive excellent care is to protect your own health and wellbeing by getting enough rest, sharing the workload, and taking breaks when you need to. Enlist family members and friends to help share the burden of caring as much as possible. If someone offers to help, be prepared with a list of things they can do such as running to the grocery store, sitting with your mom or dad while you take care of things at your own home, or stopping in for a visit a few times each week. If you don’t have family or a support network nearby, consider the possibility of respite care. Respite care is designed to give you a break from caregiving for a while so that you can recuperate or attend to other responsibilities. Lack of sleep can cause health problems such as headaches, debilitating fatigue, and mood swings. It can also compromise your immune system, making you more susceptible to illnesses. If you have trouble sleeping, talk to your doctor about possible solutions. If your mom or dad frequently needs help in the night, consider having a family member or a home care professional help you with overnight care. There will always be times you wish you had done things differently. Maybe you can’t be with your mom or dad as much as you would like to because you have work or family responsibilities. Maybe you became frustrated with them and spoke sharply. Or maybe you had to say no to hosting a holiday dinner. Don’t feel guilty about these things. If something needs to be changed, change it and then move on. If it can’t or shouldn’t be changed, then let go of the guilt you may feel and remember that you are doing the best you can. Talk to a doctor if you feel depressed or anxious. Depression and anxiety are serious conditions that shouldn’t be overlooked. If you lose interest in activities you used to enjoy, feel overwhelmingly sad most of the time, experience panic attacks, or see other signs that cause you to suspect a serious health condition, talk to your doctor. Your life should involve more than just caregiving. Taking breaks from your role as caregiver gives you an opportunity not only to feel rejuvenated, but also to stay connected with other parts of your life. Your family and friends still need you, and you need them. It’s also important to continue exercising, participating in activities you enjoy, and investing in your career. Support groups are great ways to talk about the stresses of caregiving with others who have experienced the same things. These groups offer a non-judgmental environment where you can express frustration, ask for advice, and encourage others facing similar challenges. Consider home care for additional help. When your mom or dad need more care than you can provide, home care can help. Home caregivers offer services like personal assistance, mobility assistance, incontinence care, and even help with light housekeeping. 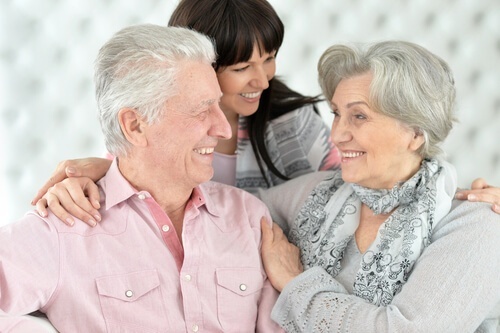 Whether your mom and dad need part-time help or twenty-four hour live-in care, you can work with a home care agency to develop a care plan that works both for you and your parents. Caring for your mom or dad as they age can be a very positive experience as your family comes together to meet the need. By ensuring that you have enough help and that you take care of your own health and wellbeing, you can manage the stress of caregiving and give your parents the best possible quality of life. To find out more about how home care can support you as you care for your aging parents, give us a call. We would love to answer your questions!